Thirteen, also known as tiến lên, is a quick and easy game originating in Vietnam (where it has been described as the national card game). It works best with four players, but you can play with as few as two or as many as six or so. A game takes about five or ten minutes, which means it’s great to play with a friend during a quick break from work or school (it’s a popular pastime among the staff in casino break rooms here in Oklahoma). Thirteen is played under several different sets of rules, so it’s important to ask the first time you play with someone what rules they are expecting. The rules laid out here are our favorite way to play, but feel free to experiment! The object of the game is to be the first to run out of cards. Alternatively, if your hand contains all four 2s or all four 3s, many players consider this to be an automatic win for the player holding them, since such a combination in one hand makes the game unbalanced enough that it’s best for the hands to be shuffled and redealt. 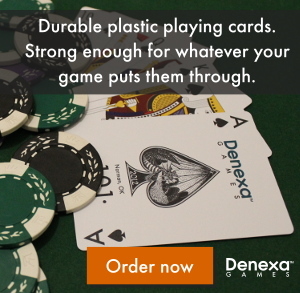 You will need a standard deck of 52 cards (we, of course, recommend Denexa 100% Plastic Playing Cards). Starting with the player to the left of the dealer, deal out thirteen cards to each player. If you’re playing with more than four players, deal an even number of cards to each player. Set aside any unused cards. Score is not kept in Thirteen, so you will not need a score sheet or pencil. Thirteen is unusual among games most players are familiar with because of the unconventional ranking of the cards. Aces rank high, as they do in many other games, but twos rank even higher than the ace. That means that the lowest card in play is the three, giving us a rank progression of (high) 2, A, K, Q, J, 10, 9, 8, 7, 6, 5, 4, 3 (low). Another unusual feature of Thirteen is the fact that the suits play a vital role in card ranking. The suits break ties when cards have the same rank. Suits rank in the following order: (high) hearts, diamonds, clubs, spades (low). (If you’re having trouble remembering the order, just remember that the two black suits are lower than the two red suits, and that a garden spade is used to dig lower in the ground, and hearts represent love, which is highly sought after by most people.) So the 6♠ would be beaten by the 6♣, but the 6♥ would be beaten by a 7♠. The lowest-ranking card in the game is the 3♠, while the highest is the 2♥. The next player to the left must play a higher-ranking instance of the same type of combination. Straights must be followed by another straight of the same length (e.g. a four-card straight must be followed up by another four-card straight, not a three-card or five-card or any other straight), and cannot include 2s. The highest-ranking card present is used to determine the ranking of the entire combination. For example, if the first player were to begin play with 3♠-3♥ (a pair), the next player could not play 3♣-3♦, since the highest-ranking card present (3♦) is lower than the highest-ranking card (3♥) played by the previous player, although they could play 4♠-4♣, since the 4♣ is higher than the 3♥. Play continues to the left, each player playing higher than the most recent combination. If a player cannot or does not want to play higher, they knock on the table, signifying such. Upon knocking, a player is temporarily out of the game, and play continues to their left. When all players but one have knocked, the sole remaining player is free to play whatever combination of cards they choose (i.e. they are not compelled to play the same type of combination as before), and all other players rejoin the game. As before, play continues to to the left, with the next player following up on the most recently played combination with a higher one of the same type. When a player is out of cards, they win! Some players will continue to play out the hand, awarding second and third-place finishes to the remaining players. It should be established whether or not this is being done before the game, since it can alter players’ strategy considerably. If you play again, you can either let the winner go first (giving them the option to play whatever they choose), or start with the player holding the 3♠, as usual. A chop can be played at any time on a player’s turn, so long as they have not knocked, regardless of what has been played before. (Many players restrict chops to only being able to defeat combinations of 2s, limiting their power.) Chops can only be beaten by a higher chop of the same type, so, in most cases, they hand control of what type of combination will be played next to whoever played them. Chops are the most powerful combination in the game! Playing with more than about six players is generally not advised, since each player will receive such a low number of cards, that the game is essentially reduced to luck of the draw. However, you can accommodate about twelve players by shuffling in a second deck of cards. 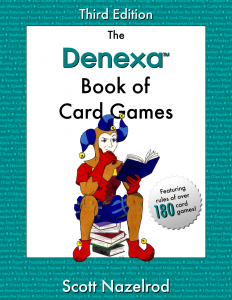 The second deck should have a contrasting back design (for example, Denexa playing cards come in two-deck sets, with red and blue backs). Select one back design as the higher-ranked one (if you are using red and blue decks, this is usually the red one, to mirror the fact that the red suits are higher). If two cards of the same rank and suit come out, the higher-backed one will prevail. Keep in mind that your opponents will be able to see how many of each back type you have, and astute players may be able to judge the strength of your hand accordingly!